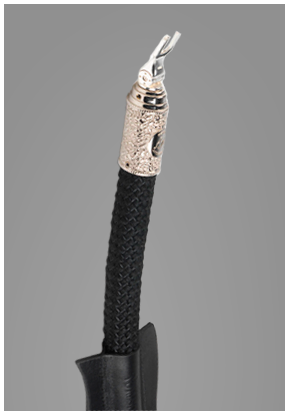 - Spade – 1.0m, 1.5m, 2.0m, 2.5m – other lengths to order. 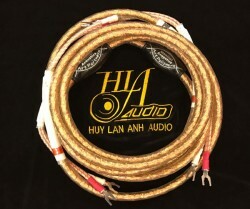 Cable diameter – 18mm - Connector diameter – 21mm - Conductor type – silver & gold - Number of conductors – 4 - Minimum insertion distance – 40mm - Banana termination available to order. 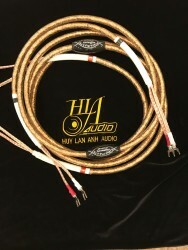 - All Virtuoso speaker cables available as single wire configuration only. Manufacturers go to great lengths to differentiate their cables from the competition – those beautiful connector bodies on the virtuoso are no coincidence. But pick up a Virtuoso cable and you’ll immediately notice just how different it really is: soft, flexible and surprisingly light, the differences here are more – much more – than just skin deep. They reflect the materials and the way they are used, the way we build the cables, their very nature. Fono Acustica cables feel different because they really are different, a difference you hear all too clearly in the music they produce. 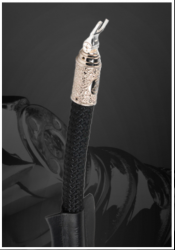 Each Virtuoso cable is hand-built: not just hand terminated but the cable itself is hand assembled. This allows us to optimize not just the wire gauge and geometry for each specific role within the system, but the materials used and the way in which they are constructed into each type of cable. So, although the solid core conductors used throughout the range are drawn in our proprietary silver/gold alloy, sourced exclusively from a single Canadian supplier, the dimensions and the way in which they are used are different in each type of cable. The interconnect cables carry the smallest and most fragile signals. In order to protect and preserve the subtlest musical details, they use dedicated conductor dimensions for single-ended, balanced, tonearm and digital designs. The analog versions use Teflon insulation in our own air-spaced construction, with an external shield. There are no fillers or tightly wound sleeves adding weight, bulk or stiffness. The conductors are inserted into a silicon sleeve and then wrapped in a cotton mix outer containing conductive filaments that add another layer of shielding. Fono Acustica Virtuoso Part science, part craft, not a little art – but all music! 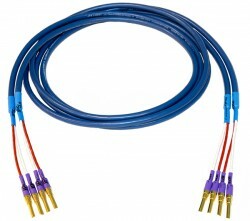 Both the speaker cables and power cords are subjected to far higher levels of mechanical energy, being connected directly to the grid and the loudspeakers. Controlling and dissipating that energy is a primary goal, reflected in the design of our renowned Sinfo AC distribution unit. The conductors for these cables are hand-wrapped in carbon filaments before insertion into loose, silicon insulation tubes wrapped in the same cotton mix outer as the interconnects. It took us many years to arrive at the precise dimensions and material proportions of these composite conductors, balancing the benefits of geometry and materials, but it was truly worth the effort. The Virtuoso power and speaker cables deliver unparalleled instrumental presence, colour and texture, music with real expressive and emotional power. The Virtuoso connectors certainly look pretty, but there’s more to them than that. Based on Oyaide hardware, the plug bodies are larger in diameter and made from silver-plated copper, their dimensions and weight carefully tuned to maximize mechanical performance. The spades are machined from solid blocks of our silver-gold alloy and include a precision hinge that allows you to optimize the cable dressing without compromising the integrity and musical qualities of their contact. 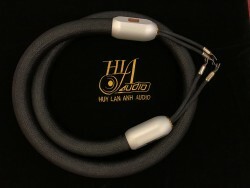 It’s typical of the care and attention that we have expended on the Virtuoso cables – the finest cables we have ever made – cables that will allow your system and your music to reach right into your soul.